This is not a film review. It’s an essay about how you view things can affect how you see things. It’s written off the back of the recent release of The Hobbit on DVD. Sometime earlier this year ‘The Hobbit’ was released in cinemas. I was very excited. I’d been waiting for years, since ‘The Lord of the Rings’ was first shown and we were told there was going to be a film version of The Hobbit made. The Lord of the Rings was released in 2001! That’s 12 years ago now. I’d been waiting for 12 years for The Hobbit to be made into a film. So it’s quite surprising then that when I went excitedly along to the cinema to see it, I walked out of the cinema about half an hour into the film to go home disappointed. Can you imagine? I had taken the wrong eyes along. The wrong eyes you say? Yes, let’s back pedal a bit to see why I was wearing the wrong eyes. The very first book I remember being engaged with for fun rather than for school work was The Hobbit. We had it read to us by our teacher at Primary School, Mr Algar. I’m trying to remember how old I was but I can’t have been more than 9 as I was seated on the right of the classroom, the ‘standard 3’ desks were lined up on the right in our school classroom. One tended to be 9 years old in standard 3 in New Zealand in those days. I can remember where I was sitting when the story was read to me, funny what you recall when you think about it. Anyway, I was captivated by the story. The Hobbit is very much an adventure story written for children you see. As a result of my love of The Hobbit story I took on the Lord of the Rings trilogy when I was a teenager. It’s too big a tale for a child not yet in their teens. It’s also an enormous physical monster as a single volume and even bigger as a set of three books. You could beat an Orc to death with a hard back copy of the Lord of the Rings. I read it twice in my teens. I’m no fan of swords and sandals epics or the dungeons and dragons style of literature. The Lord of the Rings is neither of those things but sometimes thought of as such by those who haven’t read it. It was the seminal book of my youth and when I heard it was to be made into a film I was excited beyond reason for an adult. The films did not disappoint. They were magnificent. Anyone who hasn’t seen them because they don’t like the sort of story they understand the Lord of the Rings to be is doing themselves a great disservice. They are incredible and actually have something for everyone. Quite apart from the Epic film making. For chaps there is Liv Tyler looking astonishingly beautiful as the Elf, Arwen. For countryside fans there is abundant horse flesh and incredible scenery. For the ladies there is Viggo Mortensen looking smouldering as Aragorn. If you are a techy types there is Mr Smith from the Matrix trilogy making a very impressive job in his transformation to the wise immortal Elf, Elrond. There are some giant eagles and probably the biggest set pieces in cinema history. I must have seen the films in the trilogy four or five times each. There is no swearing. I can even place the faces of people I knew. Everyone in New Zealand knows someone who has had a role as an extra in the Lord of the Rings. But this is not about the Lord of the Rings. This is about the Hobbit and how I was so disappointed by the film version of my favourite book as a child. Simply because I went to see it wearing the wrong eyes. I went along to see The Hobbit on a Friday night, as an adult. I was expecting to see the prequel to The Lord of the Rings, which is effectively what The Hobbit is. I forgot what it was. The Hobbit is a movie made of one of the greatest ever children’s adventure stories. I was watching it as an adult wearing adult eyes. I’d forgotten what it was for and who it was for. It’s for kids. Quite why this didn’t occur to me, I don’t know. Maybe because I don’t have kids around to remind me what kids like or think. I rarely interact with children so you forget you were one yourself. I did The Hobbit a disservice by expecting it to keep up with me as a grown up, an adult. 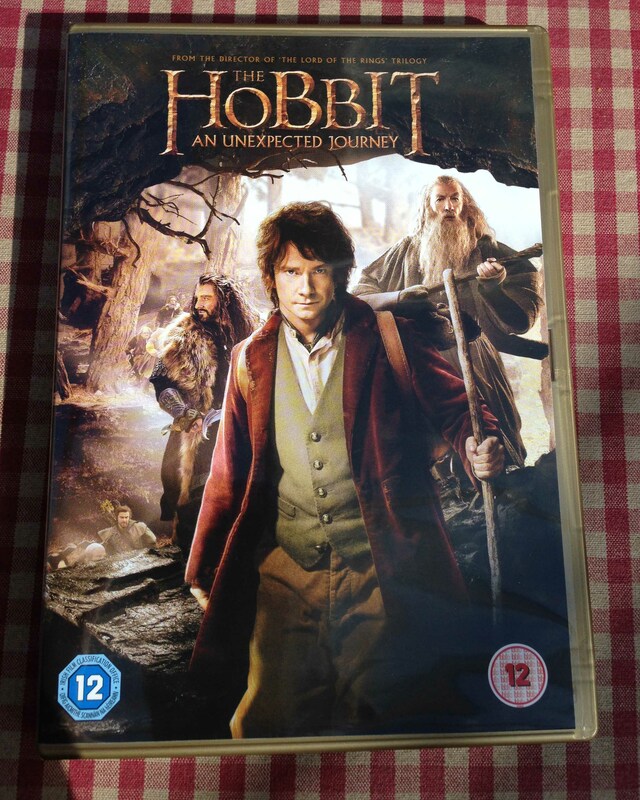 As soon as The Hobbit was released on DVD I bought it and watched it again. I watched it with the right eyes in, a child’s eyes, and it was brilliant. The characters are amazing. Each dwarf individually memorable and as they tumbled through Bilbo’s door I knew who was coming next. Dwalin and Balin, Oin and Gloin, Kili and Fili and so on. The timbre of their voices in the songs, just as I imagined them from the book. The book came flooding back, not that Pale Orc though, where did he come from? Nonsense! Stop messing with the story, it’s good enough in its own right without making stuff up to pad the story out. There was only one brief mention of an ‘Azog the Goblin’ in The Hobbit. Just once in one sentence. So back to the film. Once you get past a bit of scene setting and Dwarf meeting. The song singing and plate throwing, we crack on with the adventure. A proper adventure, for children to be enthralled by, because the story is a children’s adventure story. People who review this movie in less than glowing terms or regard it as a disappointment watched it like me, wearing the wrong eyes. They forgot how old they were when they read the book, if they ever did. If they didn’t read the book then they have no place reviewing the movie and making a judgement against the book. I have consulted some parents who took children to see The Hobbit. The children loved it and can’t wait for the next film. I wondered how on earth they could make three films from such a small book but I’m glad they have. I was transported back to a happier time by watching The Hobbit. It’s a wonderful rollicking, rip-roaring, boisterous adventure story with magnificent scenery, fantastic, amazing characters and clever writing. Thoroughly entertaining from start to end if you are wearing the right eyes to watch it. The eyes of a child. Because the Hobbit is an adventure story for children and in my memory it’s the best ever adventure story for children. I’m very excited about seeing the next two films. I shall be nine years old to watch them. I loved the book when I was young too! In fact I still have my original, tattered, dog eared copy, which has been read and re read, many, many times. I actually read this again recently, after seeing the film, and I think it’s a book for grown ups too 🙂 Loved Gollum in the film, exactly as my nine year old self pictured him! You know, my ex boyfriend had hands just like Gollum’s, I remember thinking it as I watched the film. Hmmm……. That’s a terribly unattractive hand image! I wonder what ever happened to my old copy of the Hobbit! Ha, ha! The rest of him was lovely, it was just those weird hands 🙂 His sister had exactly the same hands too, so clearly a family trait! You are bound to come across your old copy of The Hobbit some day, when I was moving house I found so many things I had forgotten about, and I was like ‘Ah, so THAT’S where they went!’ Including some blue/green sparkly heels that I used to wear everywhere about 10 years ago. I’m wearing them again right now, they are completely inappropriate footwear for anything but a night on the town, but hey, I love them! I found The Lord of the Rings first when I was about twelve or thirteen…on the 6th form shelf at school and had to ask permission to borrow the three volumes…then read The Hobbit later. I was a bit old for it by then…but remember regretting not having found it earlier. It is an adventure story for children. I should read it again as well. I well remember how facsinated you were with the stories when you were young and couldn’t believe it when you said you had walked out of the film. I thought it was brilliant. There are some very clever people living in Middle Earth !!! Your Loving Mother. Because I had the wrong eyes on mother. Thanks for that Sandy. You have encouraged me to watch it now, with the right eyes on of course. Good news Chris. Perfect DVD for a quiet night in. Yes OK, but I still thought it was a bit on the nose. This is acomment from me, a 50 year old guy who loves cartoons, and who thought Alice in Wonderland was absolutely brilliant (yes the Johnny Depp one). I have never differentiated between my child and adult as they are all part of the same make up. I think you bowed to peer pressure here matey. And what the heck stretching it out to three movies? Come on. The original hobbit book was the size of a sandwich, whicle LOTR was the size of a loaf of bread. You will see more padding, filler, unnecessary hills, dales and awkward encounters with various creatures not true to the book before getting to the actual point of the story. Alice however was a twist – an adaptation, like Baz Luhrmann did with Romeo and Juluiet or Moulin Rouge. It wasn’t supposed to be a true refelction of the book. I think the Hobbit should have been true to the original story and one movie in length. The franchise has become too greedy and the purpose of the film will have been lost in the quest for cash. That is all. I am amongst those who couldn’t/wouldn’t sit thru’ the Trilogy at the cinema. But, not wanting to be left out of dinner party conversation, we watched the films on DVD – and quite enjoyed them. Thus, we will do the same with The Hobbit. Ooo, don’t tell me, I’m going next week!